This sandwich is sure to be a hit at a Super Bowl Party or your next get together with friends. In a sauce pan, combine minced onions and beef broth. Simmer 6 to 8 minutes. Turn off heat and let onions steep at least 1 hour. Drain and hold liquid; reserving 1 cup minced onions for Glazed Onion recipe. Keep jus warm. For Glazed Onions: In a sauté pan, heat butter and oil over medium-high heat; add uncooked and precooked onions stirring often for 8 to 10 minutes or until golden and glazed. Add vinegar and continue to cook 4 to 5 minutes until reduced and almost dry. Remove from heat and cool. Place in a covered container and refrigerate until ready to use. Split each roll lengthwise and spread with 2 teaspoons mustard. 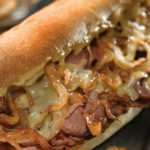 Fill each roll with 3 ounces roast beef, 1/4 cup Glazed Onions and 1/4 cup cheese. Cover and refrigerate until ready to heat and serve. To Serve: Place filled sandwich in a Panini maker 4 to 5 minutes or heat in 400 degree oven for 8 to 10 minutes or until heated through and cheese melts. 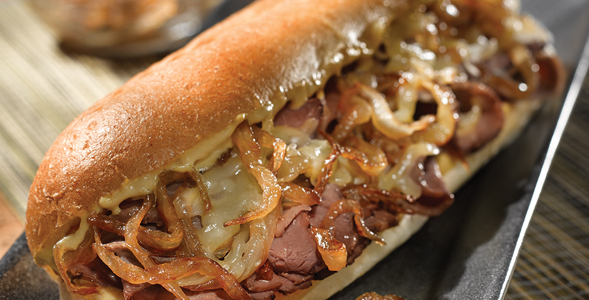 Serve each sandwich with 1/4 cup onion jus.